Property Details: 1 Bedroom, 2 Bathroom Vacation Rental, sleeps up to 6. Castle Beach townhome, beach resort home in Miami Beach This is a beautiful unique beach house located right on the water! 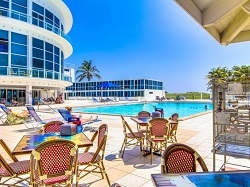 Castle Beach is the perfect choice for your visit to Miami. Castle Beach offers full service such as a restaurant ( breaksfast, lunch,dinner), large pool with a pool bar for your enjoyment, fully equipped gym and Russian & Turkish Baths. The 2-floor Beach house: Just relax from your private terrace..you are right on the sandy white beaches! No need to take the car or use the elevator to go to the beach, your private home is on the beach!! This Floor to ceiling window oceanfront townhome has 1 bedroom, 2 bathrooms, can fit up to 6 guests and is fully equipped for a vacation home. The bedroom is upstairs and has a king size bed, flat screen TV , 2 armchairs and a full bathroom. Downstairs; the living room equipped with 2 sofa beds (convertible into queen size for 2 beds), coffee table, large flat screen TV, modern dining table for 6. There is a full kitchen completely remodeled with granite counter-top, appliances , white-lacquered cabinets, cooking utensils. One bathroom is also downstairs. Both Bathrooms have been remodeled with modern white wood vanities. The beach house is equipped with a washer and dryer. Linens and towels are provided. The unit is bright and sunny, with lots of closet space. Very convenient floor plan to accommodates 6 people with a sleeping room & bathroom on each floor. Living-room gives access to a spacious 500 sq.ft private terrace with deckchairs ,outdoor dining table & sun umbrella. The best part is you can open the gate from your private terrace and you are right on the beach! Castle Beach Townhome Rental in Miami Beach FL.